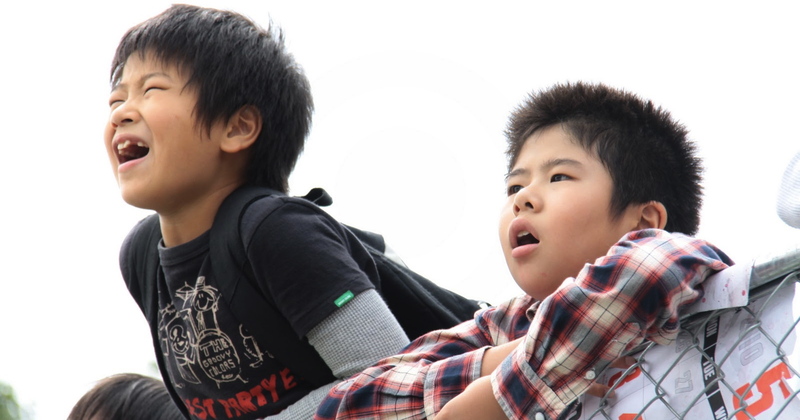 Hirokazu Kore-eda’s film I Wish (Kiseki, literally ‘miracle’) is an endearing portrait of two young brothers and their friends and family, and the desires that drive them all. Twelve-year-old Koichi (Koki Maeda) lives with his mother and her parents in suburban Kagoshima, while his younger brother Ryunosuke (Oshiro Maeda) lives with their father, a struggling rock musician, several hours away in urban Fukuoka. Koichi is a serious young man who worries about reuniting his family, while his younger brother Ryunosuke is a freer spirit who devotes his energy towards making the best of his new situation rather than trying to restore things. When Koichi hears a rumour that the new bullet train connecting their two towns can make miracles happen when two of them pass each other at a certain point, he is convinced that this mystical energy is exactly what he needs to put his family back together. With the help of their close friends, both brothers prepare to reunite for an adventure. I Wish captures the tenderness of the brothers’ daily lives as they and their friends innocently reach out for help with confronting the changes the world throws at them. I Wish is a delight to watch because it showcases superb acting by its ensemble cast – all of the characters onscreen seem so natural and immensely relatable. It’s easy to see what makes each character tick, which is rare to see onscreen in adults, let alone pre-pubescent children. I’d bet that few of us remember the unique mix of naiveté and reflection, curiosity and criticism that we had once, not to mention the boundless, restless energy; in the film, the kids seem to be running all the time! It’s enchanting to be reminded of that time of our lives when our curiosities and passions thrived, unsullied by cynicism and practical limitations, the world seemed big but not scary and our friends were everything. The cast is led by two real-life brothers, Koki and Oshiro Maeda, a comedy duo that goes by the name MaedaMaeda. The director re-wrote the script after meeting the Maeda brothers, blown away by their confidence, their comfort with improvising and their sense of fun. The other children who play their friends had mostly not acted before, but were cast for their unique personalities. All seven children are engaging because they are just starting to form their adult personalities, but are at slightly different stages of early maturity. Megumi (Kayara Uchida) is serious about becoming an actress; Makoto (Seinosuke Nagayoshi) wants to be a baseball player and loves his dog Marble; Tasuku (Ryoga Hayashi) fancies the school librarian; Kanna (Kanna Hashimoto) likes drawing; and poor Rento (Rento Isobe) loves her food but wants to be better at running. The children were not given any scripts, and their performances are successfully unforced. The director’s tactic was to tell them their lines on the day of filming, as he did when working with children for Nobody Knows in 2004. Koki was the elder statesmen of the children, aware of what was needed and guided the others. Oshiro’s guileless charm has a feminine appeal, so it suits his character to be close to three girls while his older brother hangs out with two other boys. The brothers’ contrasting personalities – one solemn, the other lighthearted – provides enough dramatic tension to propel the story forward. While the narrative perspective of I Wish is slanted heavily towards the children, this is not a Japanese Beasts of the Southern Wild – there’s no precocious voiceovers and their world is real and un-magical. The parents, grandparents, teachers and even strangers who watch over the kids in this communal society are sensitively portrayed; all have their own backstories, their own flaws and preoccupations, and support the kids from the sidelines, not as dictators. We see the brothers’ dad hanging out with his band, their mom meeting up with old classmates for karaoke, their granddad conferring with his buddies to try and revive his old career making sweets. By allowing screen time to show these small details, the film gives us fellow grown-ups the means to fully understand the world these kids inhabit. Kore-eda says of the adult characters in his film: “All the adults that appear in I Wish are all adults I want to be. I want to be an adult that casually waits for his children to come back from their adventures.” It could be argued that the adults in the film trust the kids to an extent that could seem unrealistic and impractical; but it is easy to justify and sympathise with their benign faith in them as a natural extension of the kids’ infectious exuberance and optimism. It’s a truly great film about pre-teen life: honest and unsentimental, but also gently humorous. I first saw I Wish at the 2011 London Film Festival and felt grateful to have caught it because I doubted whether it would get UK distribution – but now it has! So go see it, and reacquaint yourself with your inner child. I Wish opens in selected UK cinemas on 8 February. This entry was posted in Reviews and tagged adventure, children, ensemble cast, film, I Wish, japanese, kids, Kiseki, Kore-eda, pre-teen, world cinema on February 7, 2013 by Cath L.